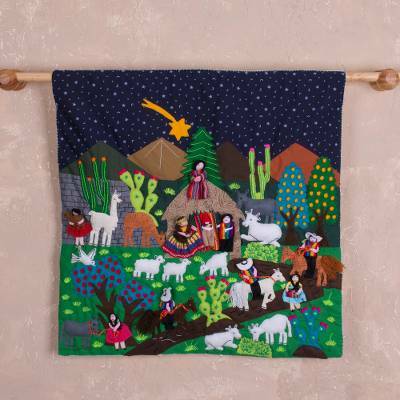 Hand Made Cotton Arpillera Wall Hanging of Andean Nativity, "Andean Nativity"
In this hand made arpillera wall hanging, artisan Leonor Quispe of Peru creates an Andean interpretation of a Nativity scene. Three peasants on horseback cross a colorful field to visit the baby in the manger. Llamas and sheep help Mary and Joseph attend the baby while an Andean angel looks on and a star shoots through the night sky. An opening in the top of the arpillera allows for insertion of a rod for easy hanging. Leonor Quispe has received 2 microcredit loans with 0% interest from Kiva and Novica, the first for $600 and the most recent for $750. "I enjoy my work because it's a lovely way to make a living. I give thanks to God for giving me this life, for health, and for blessing my hands with this talent." "I'm Leonor Quispe Urbano and I was born in Lucanas, in Ayacucho where I grew up. But terrorism was terrible in those parts of the Andes, so we moved to Lima. "When I was a girl, I loved to make doll clothes. I'd spin wool from our sheep to make tiny dresses and many other things. When I discovered the art of arpillería (patchwork), I realized this was what I'd always wanted to do. "For as long as I can remember, I've liked to craft things. Besides, necessity forced me to be creative. I realized that I could express my creativity with every scrap of fabric and bring my memories of Ayacucho to life. My work is quite painstaking, but filled with love and the traditions, culture and history of the Peruvian Andes. "Once I knitted some sweaters and, even though I worked hard and delivered them on time, I was never paid for them. To this day, I haven't received a cent for them, but that experience sowed yet another seed of love for textile arts in my heart. Despite the sacrifices, I continue to create whatever comes to mind. "I enjoy my work because it's a lovely way to make a living. I give thanks to God for giving me this life, for health, and for blessing my hands with this talent. "My greatest challenge is to have enough work to send my children to school so that they'll have the ability to defend themselves in life. "Thank you, Novica, for appreciating our art and exhibiting it to the world. This motivates me to continue working, and to improve every detail of each design." Leonor Quispe's textile work has been exhibited in a number of Peruvian venues, including the U.S. Embassy. I received my gorgeous Christmas stocking today, 'Manger in Peru"". It is truly a work of art; exquisite detail and lovely, vibrant colors! I will proudly display it in my home. You will not regret a purchase from this fine artisan. Thank you, Leonor! Merry Christmas! I purchased the Nativity Christmas Tree. The details are absolutely beautiful. Everyone who comes into my home admires it. Oh my goodness. I absolutely love the tapestry. It is so beautiful. I purchased this as a Christmas gift for my sister and I know she will love it also. Beautiful hand work. Thank you so much and may God bless.